It can be difficult to know the shade of window tint that will best suit your home, your business or your vehicle. No one solution fits all. Therefore, you need to think about your priorities and what you like most. Whether you are looking for building window tinting or car tinting there are different shades and different thicknesses of film, and even different colours. In both situations you have to think about legal regulations, be they road laws or building regulations. We can help guide on what is legal and what works best in different situations. If you on this page you are probably looking at different shades of tint for your car. Window film comes in different shades. 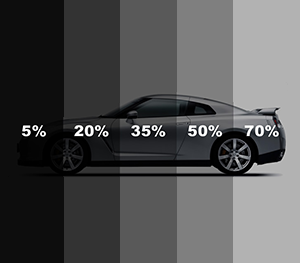 A 5% shade is typically the type you will see on a limousine. You get the blacked out look and people can’t see into your car. One of the more popular shades is the 20% dark smoke tint, which offers a fine balance between practicality and style. More subtle shades, such as the 35% light smoke film and 50% light smoke shade, offer a very different look, which many people prefer. You shouldn’t get mixed up between UV protection and window shade. All of our window film that offers UV protection will block out 99% of harmful solar rays. The window shade is all about aesthetics, and does not dictate UV protection. If you are looking for window tinting for your home or business then there will be a number of considerations. Do you want maximum privacy, being able to see through to the outside but not allowing anyone to see in? Do you need to reduce glare into your home or office? Are you trying to reduce the amount of heat coming in from the outside in hot months? If you are in the High Street you will probably want a thick film, which offers a shatter resistant, burglar resistant membrane, and perhaps a fairly dark tint. If you are looking for a conference room tint then you may look for a decorative window tint pattern with your business logo built into it. We can help you choose and provide examples from our portfolio. We are experts in the sourcing and installation of window tinting for residential, commercial, conservatory and vehicle windows. If it is glass then we can tint it. 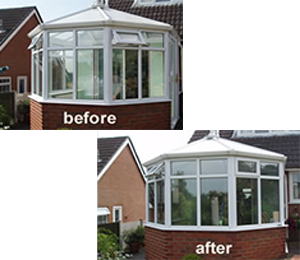 To find out more about how we can help you get the shade that you want get in touch today by phone or through our online forms today.